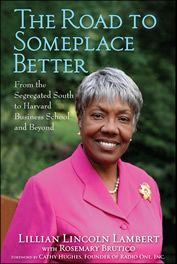 Lillian Lincoln Lambert, the first African American Woman to earn a Harvard MBA, knows how to transform challenging circumstances into an accomplished personal and professional life. Somewhat of an adventurous spirit; learning and trying new things is still paramount in her life. Over the years, her path has taken her on many adventures, some good, some not so good but there was always something to be learned from the experience. She continues to be an inquisitive, adventurous person, looking for and taking on new challenges and opportunities. Along her journey she had mentors who believed in her and helped her to believe in herself. When you believe in yourself you can chart your own course with great confidence. Those experiences led her to become an entrepreneur, an author and a career as a speaker. Her speeches are centered on the power of persistence, resilience, courage and morality in surmounting hurdles that prevent people from reaching their full potential. She knows the challenges the youth, women and small business face in this competitive world. It takes stamina, fortitude, determination and an unrelenting desire to find and fulfill your purpose in life. Let her show you how she did it. View Lillian's profile on Facebook.